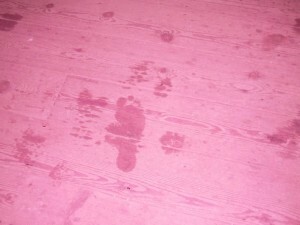 Our next two sessions were not as exciting as the first, however we did notice the “footprint” gradually fading/drying (but at a slower rate than all the shoeprints) on each of those sessions, until it was gone by the end of night. However, during our last session whilst in the Whistling Tunnel, we heard a door bang, one of the guests seeing a door open and bang shut. We initially thought it was the wind, but at that time the wind was not that strong, and the door was an internal door which wouldn’t have moved by the wind. A really interesting investigation and one we can’t wait to return to.